On competition morning coach Gary worked with me during my 8:30 a.m. practice ice. My jumps were all going well but my sit-back scratch spin combination was still a little iffy so we worked on it. Near my 11:30 a.m. warmup ice time he kept me company and helped me stretch. I had a really good five minute warmup. 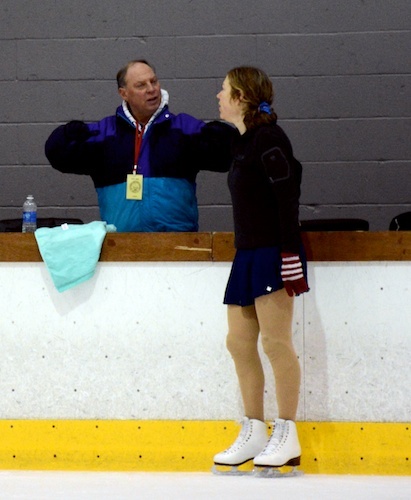 My jumps were strong and Gary had me skate them in front of the judges so they saw that I could do them, and he had me skate without my jacket so they could see my dress. The one thing that was still questionable was the sit-back scratch spin, and Gary asked me to think of what helped me on that. I thought of a tip from Ty and tried again, got a pretty good spin in before the warmup ended. I had drawn the second skate after the warmup which to me is ideal. I was able to warm up strongly, rest for a couple of minutes and then go on still warm. I wasn’t too nervous. I moved in time with the music, looked happy, and had no missteps on the footwork or grace elements. My sit-back scratch spin was OK. The sit wasn’t that centered or low but the back spin was centered and had a decent number of rotations even if they were a bit slow. Most of my jumps weren’t my best though they could have been worse. 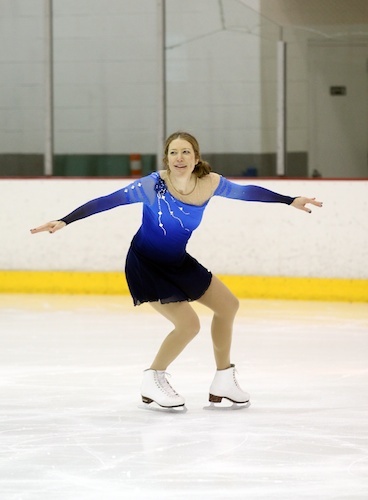 The second loop in my loop-loop combination was tiny and I double-footed my lutz slightly and my first flip heavily. 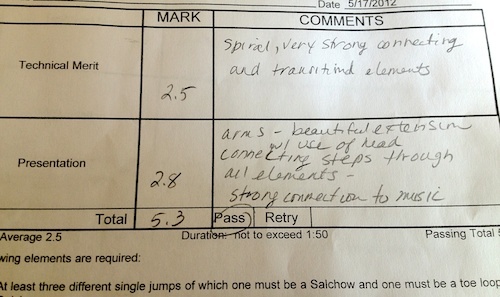 I was miffed since those jumps had gone well in my practice and warmup. Fortunately I skated my final jump, a flip/toe/toe combination, about as strongly as I could. I came in fourth out of my group of nine, and it took me a while to appreciate that result. But I did enjoy getting my photo taken with the top finishers, the first time I’ve been part of that little ritual (there is a medal for fourth). The winner was excited and happy and thinking about going to Nationals: that was fun to see. I’m glad that I got to take this program to Sectionals. Coach Lisa choreographed it beautifully, I love my music, and the dress that Kim made for me is top-notch. As I thought about it I felt better about my skate. Once I finished skating I got to just relax! Spectating at Sectionals may be my favorite part, sitting with the other skaters in the bleachers chatting about training and goals and the performances we were seeing, throwing a few ‘tossies’ onto the ice for skaters we know. There was a very high net around the ice so it was a challenge to toss the items over. Mine got through, though a few other folks’ tossie animals were stuck way up in the net– I wonder how long they will be there? 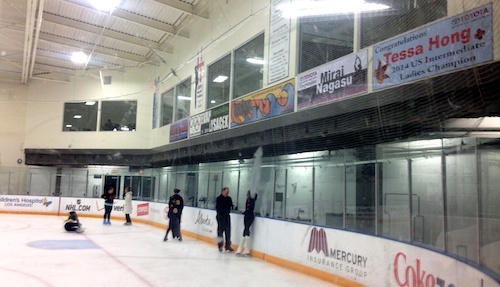 I met a reader of Fit and Fed– it was great to meet, chat, and cheer on her skate. Other skaters that I wanted to support included two ladies who I skate with, Diane Rudnick of Waltz Jump, and another student of coach Gary, a very talented masters intermediate/novice skater who was skating his first competition as an adult. I loved his music from Carmen and all his double jumps. I was inspired by the high level of skating some of the masters skaters have achieved, including a double axel from one of the ladies. Next year’s Sectionals will be in Las Vegas and I plan to be there with upgraded spins and jumps. I’m already looking forward to meeting up again with our little community of competitive adult skaters. Nationals next year will be in Salt Lake City, much closer to me than this year’s venue of Boston. Maybe 2015 will be the year I go to adult Nationals for the first time, I hope so! Passed my Bronze Freestyle Skating Test! Taking the USFSA adult bronze freestyle test. 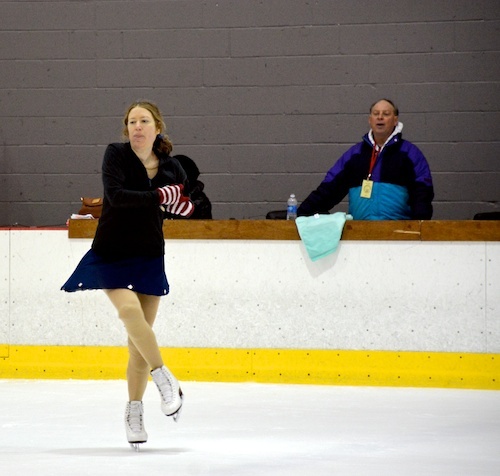 My first lutz in competition My skate at the Pacific Northwest Interclub Championships. You looked so comfortable and relaxed out there, Mary. Bravo on your wonderful performance! I absolutely *love* your dress – you looked stunning. I’m bummed that I won’t be able to meet you in Boston this year, but hopefully we can both compete in Salt Lake City next year at 2015 Nationals. Congrats on your well-deserved 4th place finish! Thanks, Eva! I do have to let Kim know how many compliments I’ve been getting on that dress– I know it’s one of her favorites, she kind of felt like keeping it! It would have been great to meet in Boston, good luck there this year! I hope we will both make it to Salt Lake! Congratulations on your beautiful skate! Wonderful Mary! Love the dress too! Very attractive on you and moved really well. I’m so blown away that you do this. It’s so cool and you look amazing doing it. What a fun sport to come to as an adult!!! Thanks, Laura! It is indeed very fun, there are no problems motivating myself to get out on the ice! Wow! You took 4th out of 9 – that is fantastic! It takes a lot of commitment to train and compete as you do. Be proud. You did awesome. How fun to watch! You looked so fluid to me – I’m incredibly impressed. How old were you when you started? Thanks, Susan! As a child, I learned to skate on a pond at 3 and had lessons in the winters starting in elementary school. I only learned the basics, did not compete, but it did give me some advantages in my skating now, like the fact that I know how to fall without hurting myself (much) and am not afraid of falling. 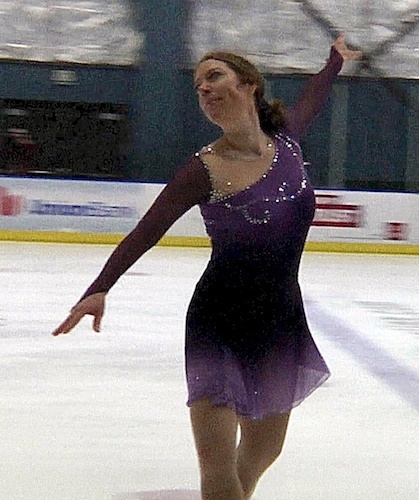 As an adult, I skated once in a while but only started training regularly nine years ago. How to fall without hurting yourself – I could sure do with those lessons! I’m so afraid to fall and that’s the biggest thing holding me back in my skating. I’ve fallen a total of three or four times in the two-and-a-half years I’ve been skating, broken my wrist badly one of those times, so it’s a true fear factor now. You looked fab in your skate, and what interesting music. I’m sure that breaking your wrist set you back on that front. You have to train yourself to fall without breaking your fall with your hand. I wish I could give you a demo, but I’m sure your coach can (I stretch out and roll onto my side, with my head protected by the inside of my upper arm). It’s not perfect, I have a tendency to fall onto my knees fairly often so I wear knee pads. And there’s always the occasional hard fall that gets you– I’ve been babying my left forearm for weeks after hitting it quite hard on a fall out of front crossovers, even went to the doctor to see if it could be broken. I’m glad you liked my skate! I was very happy to find that music. Wow, great job Mary – you have nice flow out there! And I second the dress sentiments – it’s lovely! Can I just say ditto to what everybody else said? 🙂 Well done!! Congrats Mary! This was so much fun to watch and it looks like you had fun skating it. Your final combo jump and finishing spin were especially beautiful and your dress is gorgeous. Well done! Beautiful skate! You looked really happy and relaxed – well done! Thanks Jules! I was definitely more relaxed than last year! > Falling is certainly a huge concern for all of us. Sadly, most adult skaters coming into the sport new or coming back from childhood skating including myself, have never even been instructed on how to fall properly and are afraid of it. I am sure that others would agree that one spill will put extra fear in the head and really hold back improvement in skating advancement. I want to explore it further and work with someone off ice before applying it to the ice. Always something new to learn isn’t there? Love the dress and all the moves in this program! Thanks Kate! This is the dress I would have worn again this year if Gary hadn’t helped me find a new one.